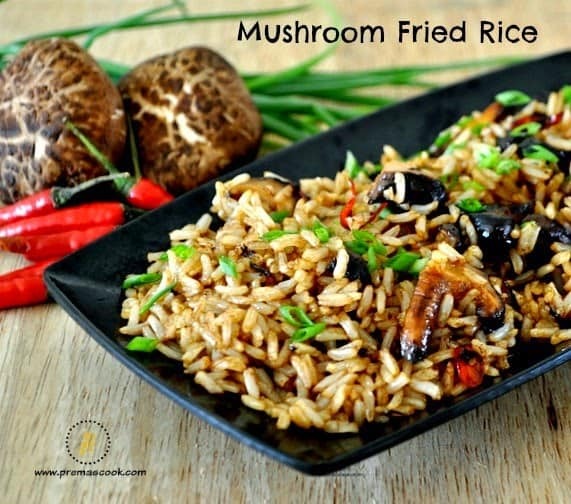 Mushroom Fried Rice recipe using brown rice is very healthy one and love to share here the Chinese version.I always serve this amazing fried rice recipe with all of my chinese dishes.I have posted Fried rice recipe(Indo Chinese) using basmati rice and the procedure how to cook basmati rice.No special side dish is required to taste this rice.Before proceeding with the recipe ,here is the method of making brown rice. Brown rice is such an important and healthy staple in my kitchen.I have started using it after i come to sg.Brown rice is much more nutritious than white rice and makes for a healthy, yet filling meal.Initially find difficult to cook in pressure cooker.As a Indian we love to have rice more, in that case if we take brown rice it will help us to stay healthy and fit. If you cook brown rice in electric cooker the rice is very grainy and after sometime it will become dry so cooking the rice in pressure cooker would be a good choice. 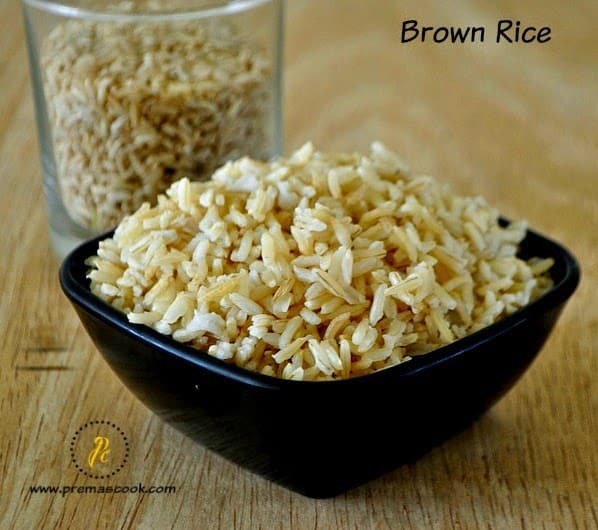 It won’t make much difference.Cooking brown rice is easy and basic, but it takes a little more water and time than regular white rice. Here’s how to do it, using Pressure cooker method. 1 cup brown rice will yields approximately 3 cups of cooked rice. I used unpolished brown rice. Rinse the rice thoroughly and rinse, until the water runs clear. Add it into the pressure cooking,now add water and let it soak for 20 minutes.Cook it till the rice become soft,usually i will keep 4-5 whistles.Wait for 5 minutes and then open the lid ,rice gets cooked completely. Cook and keep the rice make ready.Heat oil in a big wok,add sliced chilly and mushroom, fry for 2 minutes. Now add in the sauce,vinegar and salt.Toss it for a while. Now add in the rice and mix well ,toss it.Finally add pepper and saute for a while and off the stove. garnish with spring onions and serve. Don’t add the hot steaming rice into the wok,once you cooked the rice let it cool down for sometime and then start making fried rice. Don’t saute the mushroom for long because it becomes too soft if you saute it for long. mushroom fried rice looks delicious and mouthwatering.. nice presentation.. I love your frying pan.. 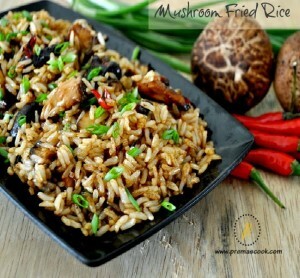 Perfectly cooked Brown Rice, I love fried rice with brown rice than the jasmine rice or basmati rice, pics looks too tempting! Love your pan!! Nice and yummy rice!